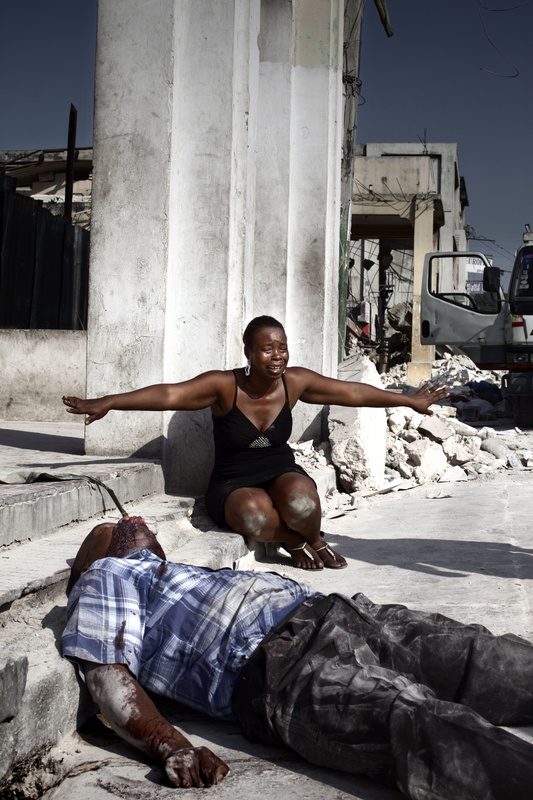 At 4:53 pm on 12 January 2010, a violent earthquake, measuring seven on the Richter Scale, hits Haiti, in the heart of the Caribbean. The quake, one of the most deadly in recent history, brings to its knees one of the world’s poorest countries, where 80% of the population already lives in a condition of debilitating poverty and 54% makes due with less than a dollar a day. The statistics are dramatic: 222 thousand dead, 310 thousand injured, more than 900 thousand buildings destroyed. 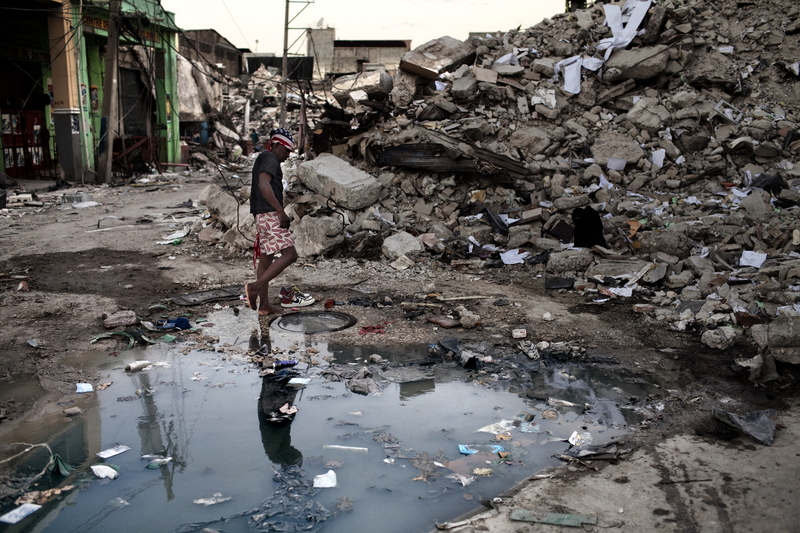 The capital of Port-au-Prince, 25 kilometres from the epicentre, suffers enormous damage: the presidential palace, the parliament building, the cathedral, the UN headquarters, four hospitals and the main prison are among the buildings destroyed or seriously damaged, along with a large number of homes and all the primary infrastructures. The images of desperate people searching for the missing, or for resources for their survival, as well as the state of utter dysfunction into which the country fell, move the entire world, setting in motion the most noteworthy mechanism of humanitarian aid ever recorded for a similar event. 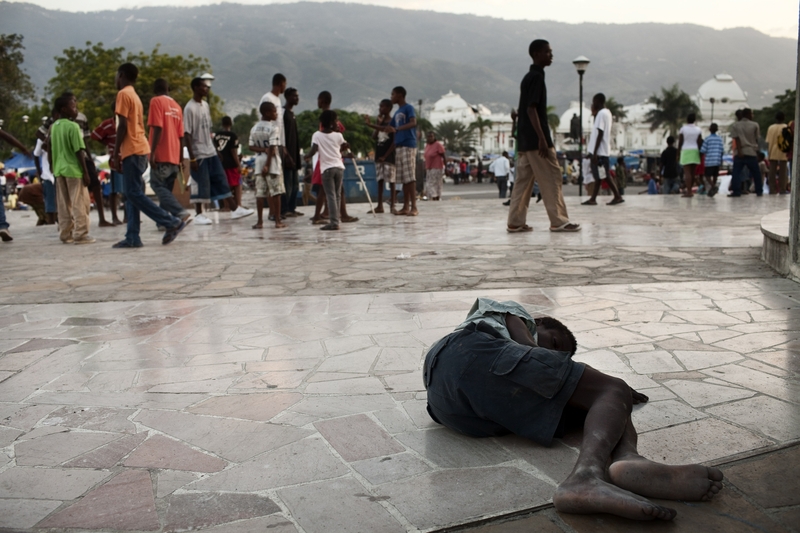 Bunt while thousands of people leave Haiti in search of assistance abroad, controversy over the management of the aid further complicates the humanitarian emergency. Despite the initial outpouring of generosity from many countries, the arrival of the goods made available for the survivors is delayed, and the military and civilian operations, led by the United States, come in for heavy criticism. The chief complaint regards the lack of a plan for reconstruction of the country able to involve the local community while working towards a renewed political and social balance, a situation that places a damper on the hopes of Haitians for a dignified outlook on their future. After the promises of aid not kept by the international community, as well as the failure of a government too weak to move beyond the phase of paralysis that followed the disaster, the anguish caused by the earthquake is augmented by a fear of being abandoned. 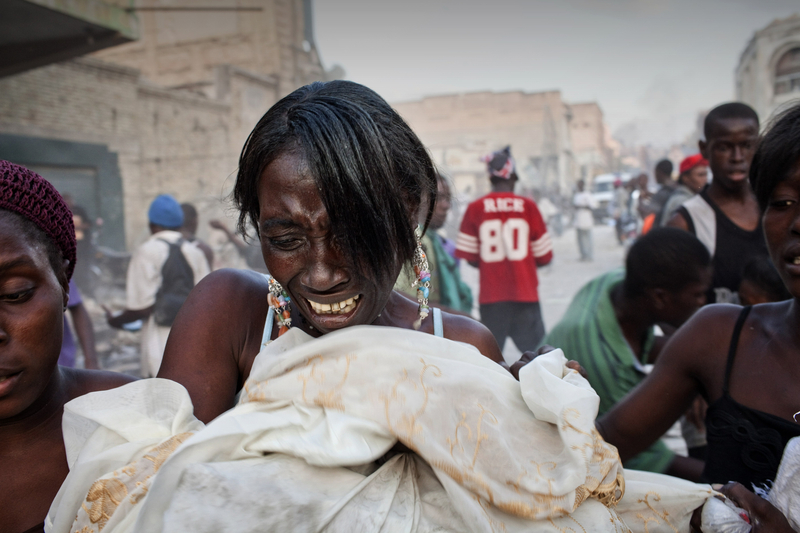 Haitian looters crying after fighting with other looters in the city center. As many as 200,000 people died on January 12, 2010 as a consequence of a 7.0-magnitude earthquake. At least 130 people have been pulled alive from the rubble. An estimated 1.5 million people have been left homeless. The Haitian government is planning to relocate some 400,000 people, currently in makeshift camps across the capital, to temporary tent villages outside the city. Aid agencies struggled to supply food and water to survivors, while thousands of Haitians who suffered serious injuries remain in need of urgent medical attention. 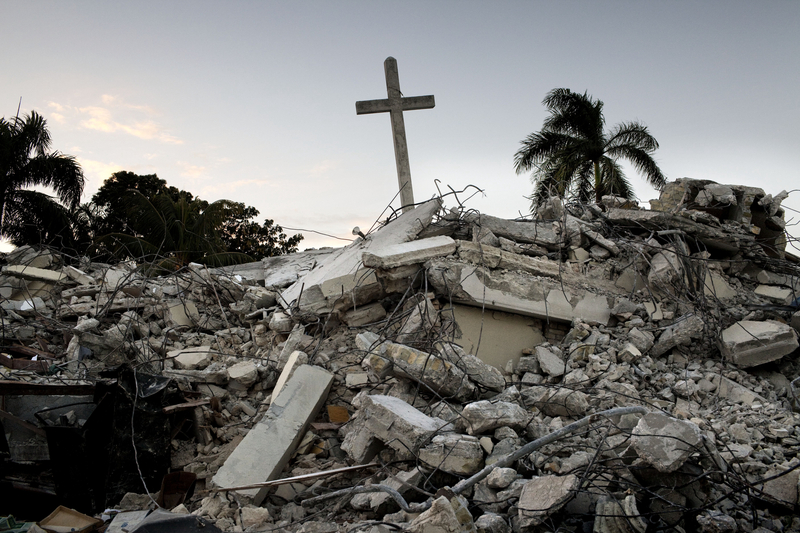 A cross rises from the rubble of a church destroyed during the earthquake. As many as 200,000 people died on January 12, 2010 as a consequence of a 7.0-magnitude earthquake. At least 130 people have been pulled alive from the rubble. An estimated 1.5 million people have been left homeless. The Haitian government is planning to relocate some 400,000 people, currently in makeshift camps across the capital, to temporary tent villages outside the city. Aid agencies struggled to supply food and water to survivors, while thousands of Haitians who suffered serious injuries remain in need of urgent medical attention. 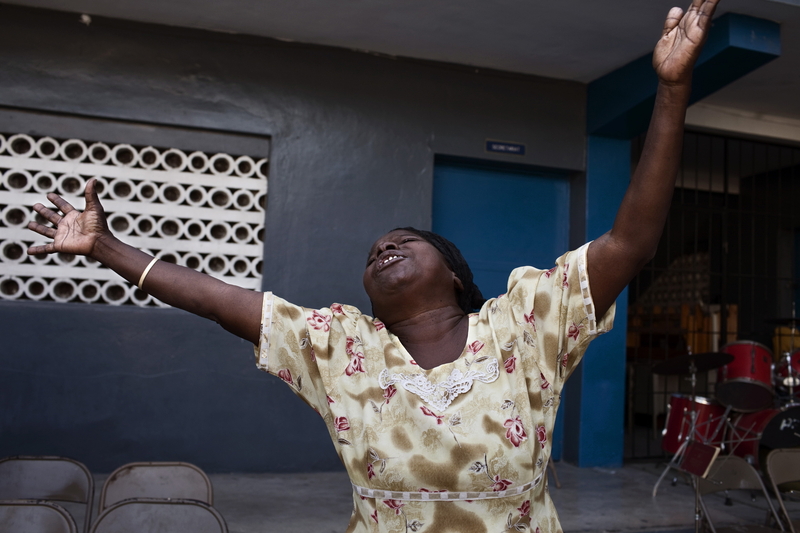 A women of the Salvation Army prays and chants during a Sunday service at the Salvation Army makeshift church in front of the original church damaged by the earthquake. As many as 200,000 people died on January 12, 2010 as a consequence of a 7.0-magnitude earthquake. At least 130 people have been pulled alive from the rubble. An estimated 1.5 million people have been left homeless. The Haitian government is planning to relocate some 400,000 people, currently in makeshift camps across the capital, to temporary tent villages outside the city. Aid agencies struggled to supply food and water to survivors, while thousands of Haitians who suffered serious injuries remain in need of urgent medical attention. A Haitian man finishing washing himself in a puddle of water on. As many as 200,000 people died on January 12, 2010 as a consequence of a 7.0-magnitude earthquake. At least 130 people have been pulled alive from the rubble. An estimated 1.5 million people have been left homeless. The Haitian government is planning to relocate some 400,000 people, currently in makeshift camps across the capital, to temporary tent villages outside the city. Aid agencies struggled to supply food and water to survivors, while thousands of Haitians who suffered serious injuries remain in need of urgent medical attention. 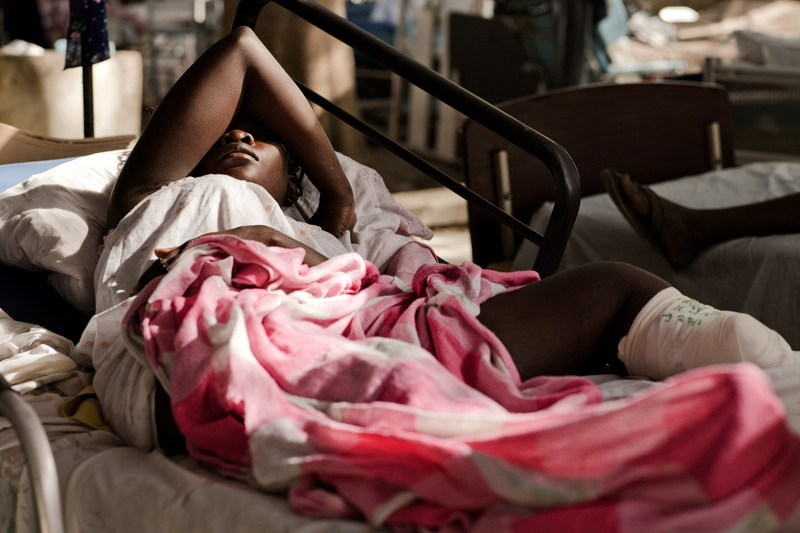 A Haitian woman giving birth at the General Hospital. As many as 200,000 people died on January 12, 2010 as a consequence of a 7.0-magnitude earthquake. At least 130 people have been pulled alive from the rubble. An estimated 1.5 million people have been left homeless. The Haitian government is planning to relocate some 400,000 people, currently in makeshift camps across the capital, to temporary tent villages outside the city. Aid agencies struggled to supply food and water to survivors, while thousands of Haitians who suffered serious injuries remain in need of urgent medical attention. 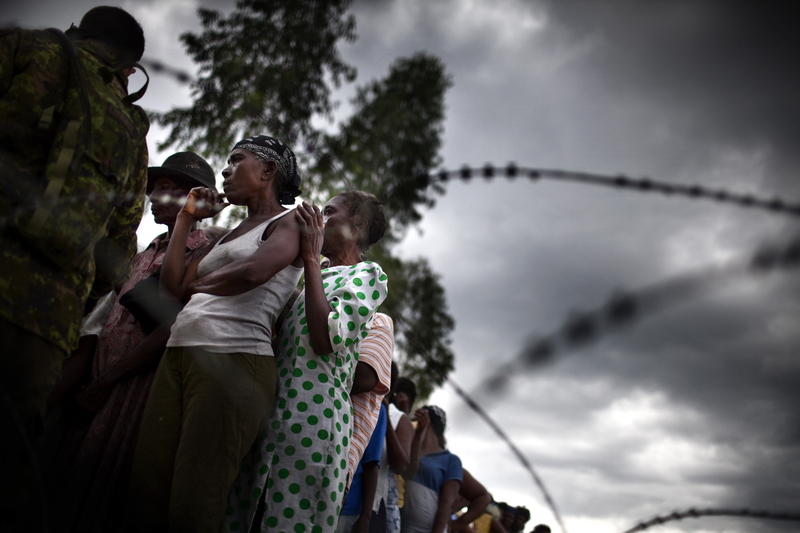 Hundreds of Haitians stand in line as they attend a food distribution guarded by Canadian soldiers and UN Peacekeepers. As many as 200,000 people died on January 12, 2010 as a consequence of a 7.0-magnitude earthquake. At least 130 people have been pulled alive from the rubble. An estimated 1.5 million people have been left homeless. The Haitian government is planning to relocate some 400,000 people, currently in makeshift camps across the capital, to temporary tent villages outside the city. Aid agencies struggled to supply food and water to survivors, while thousands of Haitians who suffered serious injuries remain in need of urgent medical attention. A Haitian woman waits on a chair for her turn to have her children treated by U.S. medics of the Detroit Area Haiti Outreach Mission in a temporary camp. As many as 200,000 people died on January 12, 2010 as a consequence of a 7.0-magnitude earthquake. At least 130 people have been pulled alive from the rubble. An estimated 1.5 million people have been left homeless. The Haitian government is planning to relocate some 400,000 people, currently in makeshift camps across the capital, to temporary tent villages outside the city. Aid agencies struggled to supply food and water to survivors, while thousands of Haitians who suffered serious injuries remain in need of urgent medical attention. 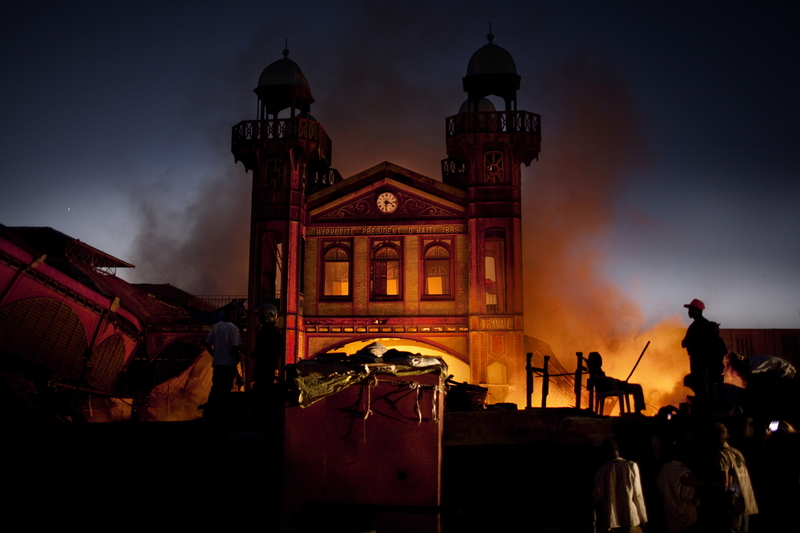 An old colonial building set on fire by looters at the city center market. As many as 200,000 people died on January 12, 2010 as a consequence of a 7.0-magnitude earthquake. At least 130 people have been pulled alive from the rubble. An estimated 1.5 million people have been left homeless. The Haitian government is planning to relocate some 400,000 people, currently in makeshift camps across the capital, to temporary tent villages outside the city. Aid agencies struggled to supply food and water to survivors, while thousands of Haitians who suffered serious injuries remain in need of urgent medical attention. 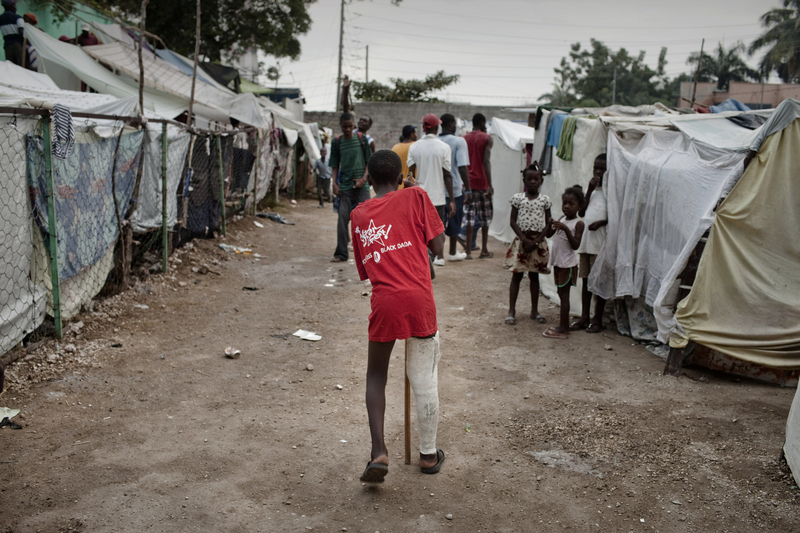 An Haitian boy injured during the eartquake walks in a makeshift tent camp. As many as 200,000 people died on January 12, 2010 as a consequence of a 7.0-magnitude earthquake. At least 130 people have been pulled alive from the rubble. An estimated 1.5 million people have been left homeless. The Haitian government is planning to relocate some 400,000 people, currently in makeshift camps across the capital, to temporary tent villages outside the city. Aid agencies struggled to supply food and water to survivors, while thousands of Haitians who suffered serious injuries remain in need of urgent medical attention. Babies at the Faith Hope Love Infant Rescue Orphanage managed by a US citizen named Deborah Pearce. Dorothy Pearce a U.S. Citizen founded the Faith Hope Love Infant Rescue Orphanage five years ago answering what she describes as a ‘call by God’ to leave her job as a real estate agent in Miami to come to Haiti.She runs the organization from her home in Port-au-Prince taking in children whose families are unable to support them. She is currently caring for 20 children.In the backyard strewn with rubbish, ten babies lie sleeping on the dirty concrete floor under a canopy of plastic sheeting, many are newborn. The older children play largely unobserved by the nannies barefoot amongst rusted tins. A fetid swimming pool is covered with a cloud of mosquitoes.Three dogs, whose feces litter the small concrete play area, lick the children’s faces as they play and lie on the floor. Several of the children are HIV positive and many suffer with severe disabilities. Most of the children appear listless, either clamoring to be held or curled up sleeping awkwardly on the floor. Others sit crying, unattended.One of the children, Alexandra, two, was injured in the earthquake. Pearce who has not received any medical training, cuts dead flesh from an open wound on the injured child’s foot as she screams in agony.Pearce has not registered her charity with the Haitian government and the orphanage is entirely unregulated.Prior to the earthquake that devastated the island on January 12th, 2010 there were an estimated 380,000 children living in orphanages in Haiti, 500 of which were unregistered. 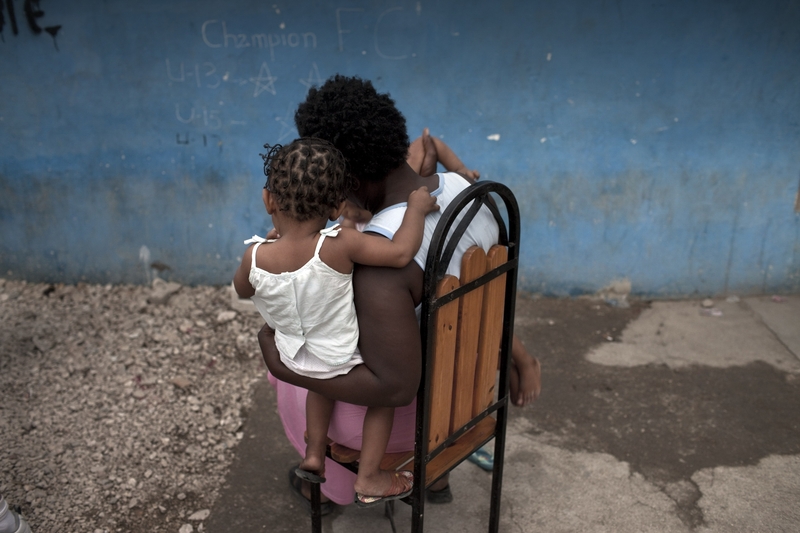 Since the disaster, in which thousands of children were separated from their families, the dangers facing Haiti’s orphans have never been more acute. 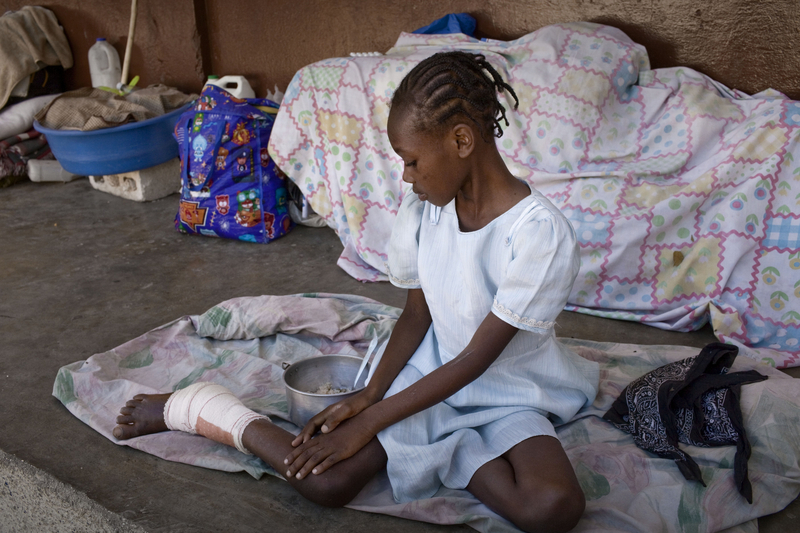 A Haitian woman who lost her left leg during the eartquake recovers in her hospital bed under a tent in the courtyard of the General Hospital. As many as 200,000 people died on January 12, 2010 as a consequence of a 7.0-magnitude earthquake. At least 130 people have been pulled alive from the rubble. An estimated 1.5 million people have been left homeless. The Haitian government is planning to relocate some 400,000 people, currently in makeshift camps across the capital, to temporary tent villages outside the city. Aid agencies struggled to supply food and water to survivors, while thousands of Haitians who suffered serious injuries remain in need of urgent medical attention. A street child in front of the Presidential Palace. 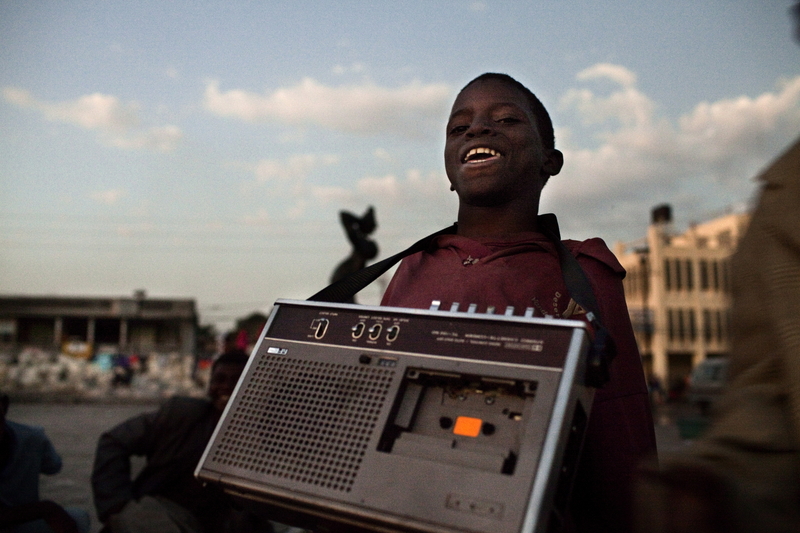 A group of around 15 boys live on the street opposite the collapsed presidential palace. Several lost both parents in the earthquake. They sleep, find food and spend their days together, mostly gambling with a few coins. The oldest, Simon is 18-years-old and the youngest Daniel is 13-years-old. As many as 200,000 people died on January 12, 2010 as a consequence of a 7.0-magnitude earthquake. At least 130 people have been pulled alive from the rubble. An estimated 1.5 million people have been left homeless. The Haitian government is planning to relocate some 400,000 people, currently in makeshift camps across the capital, to temporary tent villages outside the city. Aid agencies struggled to supply food and water to survivors, while thousands of Haitians who suffered serious injuries remain in need of urgent medical attention. 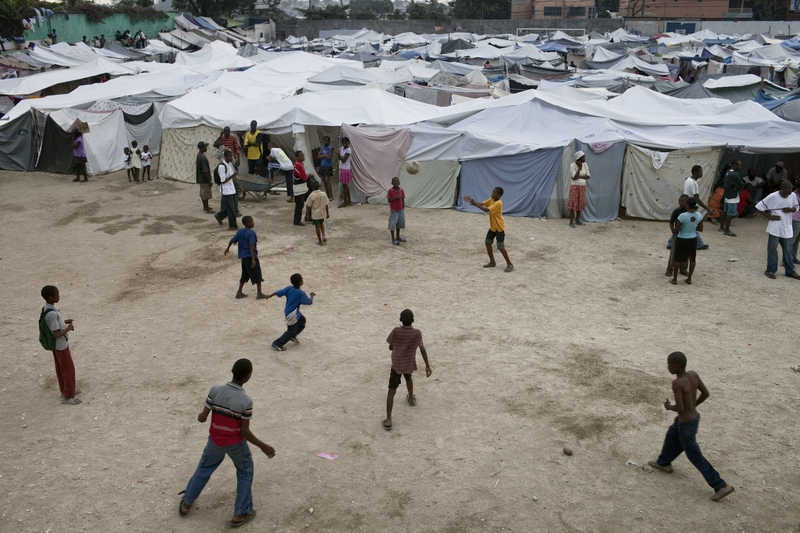 Haitian children play soccer in a temporary camp. As many as 200,000 people died on January 12, 2010 as a consequence of a 7.0-magnitude earthquake. At least 130 people have been pulled alive from the rubble. An estimated 1.5 million people have been left homeless. The Haitian government is planning to relocate some 400,000 people, currently in makeshift camps across the capital, to temporary tent villages outside the city. Aid agencies struggled to supply food and water to survivors, while thousands of Haitians who suffered serious injuries remain in need of urgent medical attention. 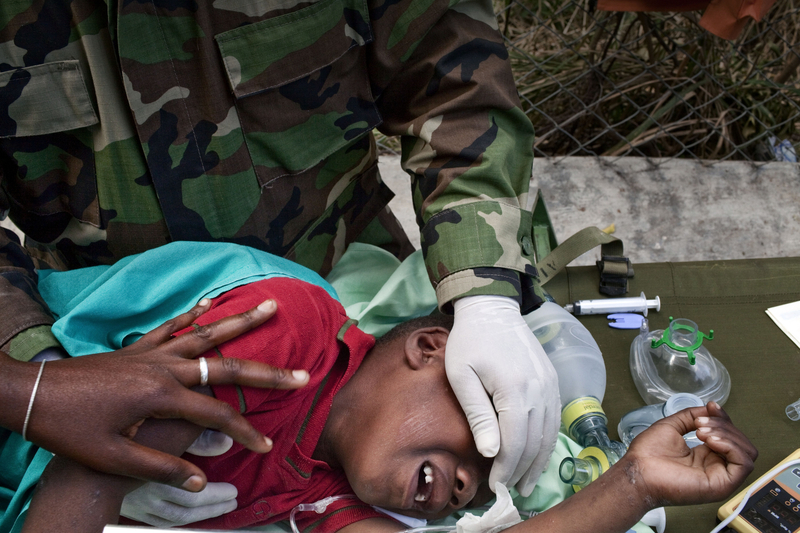 Nicaraguan Civil Defense Medics treat Kevin Epolite, 7 years-old at a makeshift hospital at the Juvena Park. Kevin was left by his mother Modeleon 25-years old, to study in their house patio when the earthquake struck and she had to rush back from the market and dig to find him in the rubble of the house. He had a severe injury to his leg and was turned away from several hospitals untill when he ended up being treated in the park by the Nicaraguan Civil Defense. As many as 200,000 people died on January 12, 2010 as a consequence of a 7.0-magnitude earthquake. At least 130 people have been pulled alive from the rubble. An estimated 1.5 million people have been left homeless. The Haitian government is planning to relocate some 400,000 people, currently in makeshift camps across the capital, to temporary tent villages outside the city. Aid agencies struggled to supply food and water to survivors, while thousands of Haitians who suffered serious injuries remain in need of urgent medical attention. 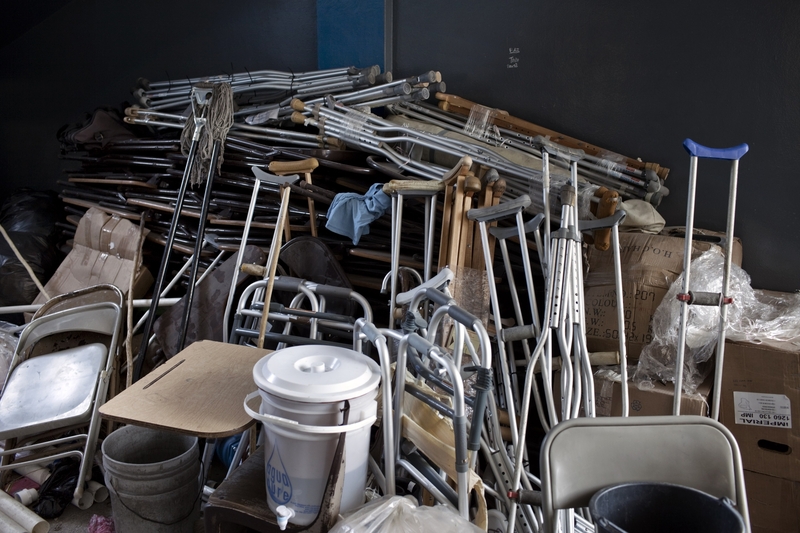 Dozens of crutches at the Salvation Army clinic in front of the original Salvation Army church damaged by earthquake. As many as 200,000 people died on January 12, 2010 as a consequence of a 7.0-magnitude earthquake. At least 130 people have been pulled alive from the rubble. An estimated 1.5 million people have been left homeless. The Haitian government is planning to relocate some 400,000 people, currently in makeshift camps across the capital, to temporary tent villages outside the city. Aid agencies struggled to supply food and water to survivors, while thousands of Haitians who suffered serious injuries remain in need of urgent medical attention. 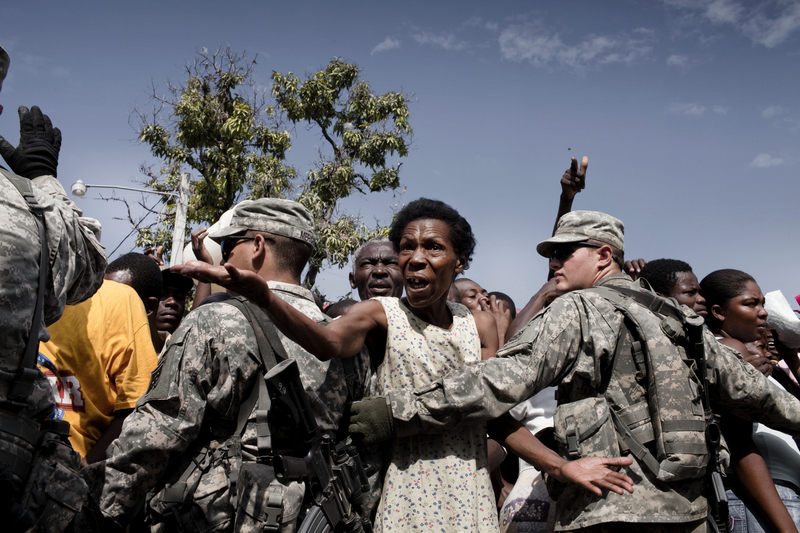 A Haitian elderly woman is held back by U.S. soldiers of the 82nd Airborne Division at a food distribution. As many as 200,000 people died on January 12, 2010 as a consequence of a 7.0-magnitude earthquake. At least 130 people have been pulled alive from the rubble. An estimated 1.5 million people have been left homeless. The Haitian government is planning to relocate some 400,000 people, currently in makeshift camps across the capital, to temporary tent villages outside the city. Aid agencies struggled to supply food and water to survivors, while thousands of Haitians who suffered serious injuries remain in need of urgent medical attention. A street child in front of the Presidential Palace. A group of around 15 boys live on the street opposite the collapsed presidential palace. Several lost both parents in the earthquake. They sleep, find food and spend their days together, mostly gambling with a few coins. The oldest, Simon is 18-years-old and the youngest Daniel is 13-years-old. As many as 200,000 people died on January 12, 2010 as a consequence of a 7.0-magnitude earthquake. As many as 200,000 people died on January 12, 2010 as a consequence of a 7.0-magnitude earthquake. At least 130 people have been pulled alive from the rubble. An estimated 1.5 million people have been left homeless. The Haitian government is planning to relocate some 400,000 people, currently in makeshift camps across the capital, to temporary tent villages outside the city. Aid agencies struggled to supply food and water to survivors, while thousands of Haitians who suffered serious injuries remain in need of urgent medical attention. A Haitian woman mourns next to the body of her brother, an Haitian-American citizen who was robbed and shot dead on the street. As many as 200,000 people died on January 12, 2010 as a consequence of a 7.0-magnitude earthquake. At least 130 people have been pulled alive from the rubble. An estimated 1.5 million people have been left homeless. The Haitian government is planning to relocate some 400,000 people, currently in makeshift camps across the capital, to temporary tent villages outside the city. Aid agencies struggled to supply food and water to survivors, while thousands of Haitians who suffered serious injuries remain in need of urgent medical attention. A Salvation Army faithful arrives to pray and chant during a Sunday service at the Salvation Army makeshift church in front of the original church damaged by earthquake. A street child in front of the Presidential Palace. A group of around 15 boys live on the street opposite the collapsed presidential palace. Several lost both parents in the earthquake. They sleep, find food and spend their days together, mostly gambling with a few coins. The oldest, Simon is 18-years-old and the youngest Daniel is 13-years-old. As many as 200,000 people died on January 12, 2010 as a consequence of a 7.0-magnitude earthquake. At least 130 people have been pulled alive from the rubble. An estimated 1.5 million people have been left homeless. The Haitian government is planning to relocate some 400,000 people, currently in makeshift camps across the capital, to temporary tent villages outside the city. Aid agencies struggled to supply food and water to survivors, while thousands of Haitians who suffered serious injuries remain in need of urgent medical attention. 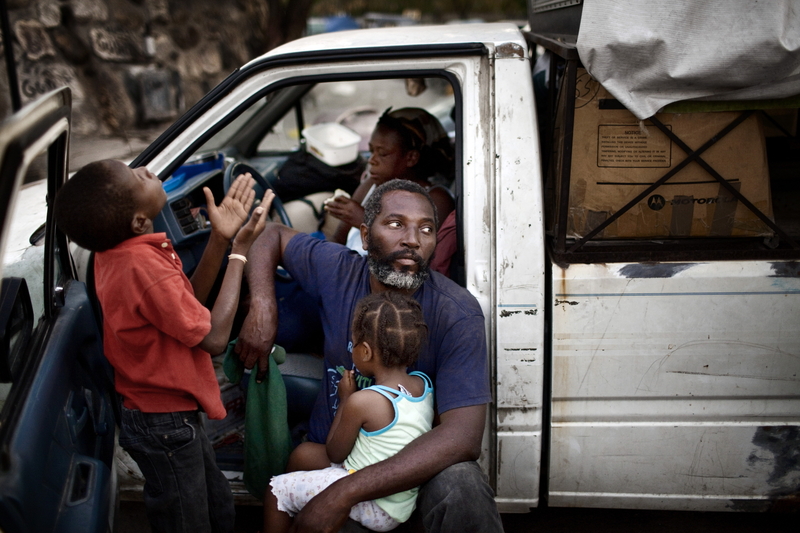 Vincent Nober, his wife Carline Celistine and two of their children next to their car where they live with Wardensen Exilius, 8-years-old and his mother since the earthquake. Vincent and his wife lost their 14-year old son in the earthquake and are now hosting Wardensen Exilius, 8-years-old and his mother in their car. At least 130 people have been pulled alive from the rubble. An estimated 1.5 million people have been left homeless. The Haitian government is planning to relocate some 400,000 people, currently in makeshift camps across the capital, to temporary tent villages outside the city. Aid agencies struggled to supply food and water to survivors, while thousands of Haitians who suffered serious injuries remain in need of urgent medical attention. Francia Dessaus, 10-years-old lies on the floor in a temporary camp where Save the Children is running a” Child Friendly Space,” a safe area for children to play in and a mobile clinic.Francia lives in the camp with her mother, Settha 35-years-old and with her older sister Sanine, 12-years-old. They were all in the house together during the earthquake and her father was badly injured and moved to Santo Domingo for which they haven’t heard from him since. Francia was injured as well at her right feet and they had to dig their father out of the rubble. At least 130 people have been pulled alive from the rubble. An estimated 1.5 million people have been left homeless. The Haitian government is planning to relocate some 400,000 people, currently in makeshift camps across the capital, to temporary tent villages outside the city. Aid agencies struggled to supply food and water to survivors, while thousands of Haitians who suffered serious injuries remain in need of urgent medical attention. Clarmante Petit Tomb, 26-years-old with 5-year-old Johnlee at her makeshift house in what was a school , now turned into a temporary camp. Clarmante camps in the park next to the National Theatre. She is taking care of five-year-old Johnlee, her niece’s brother, not related to her by blood. She has no income and worries she will have to put Johnlee into a orphangae if someone doesn’t help her to support him. Johnlee is malnourished and rarely smiles.As many as 200,000 people died on January 12 as a consequence of the 7.0-magnitude earthquake. At least 130 people have been pulled alive from the rubble. An estimated 1.5 million people have been left homeless. The Haitian government is planning to relocate some 400,000 people, currently in makeshift camps across the capital, to temporary tent villages outside the city. Aid agencies struggled to supply food and water to survivors, while thousands of Haitians who suffered serious injuries remain in need of urgent medical attention.